What do you do if the person you liked on Tinder turns out to be a lot less likeable in real life? You could feign a heart attack, have a pal call you with an invented emergency, or just pretend you need the toilet and run as if the Devil himself were on your tail. Or you could take the coward's way out and dump them digitally with the Binder app. Binder - it rhymes with Tinder - is an iOS and Android app, and it's designed to kick people to the kerb, deliver the old dumparoonie and give them the Spanish archer. It's the Tinder of dumping people. 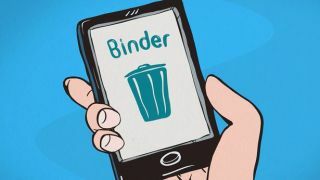 If you thought ending relationships by SMS was a bit harsh, Binder takes things a step further: give it the name of the person you want to dump, hand over their mobile number and Binder will call them to deliver the bad news on your behalf. It'll also text them to make doubly sure, and if you want to make yourself look even more of a monster you can share the good news on your favourite social network too. The good news is that Binder is meant as a joke - the break-up calls are quite funny, and the app is based on one of a series of cartoons by a Scottish brewery - and you can tell from the tongue-in-cheek testimonials on the Binder website ("Some say love is the key to happiness. Those people are wrong") that this isn't an app to take seriously. But we can't help wondering if some people will do just that, and use Binder for real. That's not just us in "humanity's done and it's time for the cockroaches to take over" mode. In the US, the Trash Day app enables San Franciscans to get someone else to put their bins out for them, and nobody appears to know whether the app is a Nathan Barley-style parody of tech startups or a genuine service (and if it is a parody, then Here Comes The Airplane is a parody of that parody). There's no doubt that some people would rather live their entire lives through apps if they could, and maybe that includes dumping dates too. Does that sound far-fetched? Try explaining hipsters, Uber and Tinder to your gran. If there's one thing we can confidently predict about the future, it's that it'll be weirder than we can possibly imagine.